SOME WINE LOVERS fear it. Many winemakers overdo it. And most every wine merchant and sommelier spends lots of time explaining it. I'm talking about the relationship between wine and oak, a perennial hot topic in the wine world. Wine has been matured in oak barrels for centuries, of course; some of the greatest wines in the world are aged in oak, sometimes for several years. Yet a backlash against oak has been building for decades, and it seems to have gained momentum in recent years. More and more winemakers have either reduced the time their wines spend in oak or eliminated the use of oak altogether, believing the practice can obscure the true taste of a wine. Rioja-based winemaker Telmo Rodríguez called oak a "cosmetic" in a recent email to me, saying that it masks "the taste of the terroir"-and he's far from alone in his opinion. How could something so important be so maligned? The right oak barrel, judiciously employed, can add character and interest, structure and richness to a red or white and even some rosés. But oak can also overpower a wine if it's a poor match, resulting in that feared and maligned "oaky" wine. The oak applied to Chardonnay is invariably French oak, more or less the gold standard for barrels in the case of both red and white wines-and its price reflects that fact. A new French oak barrel from a top cooperage (tonnellerie) costs around $1,000, while a new American oak barrel costs about $600. 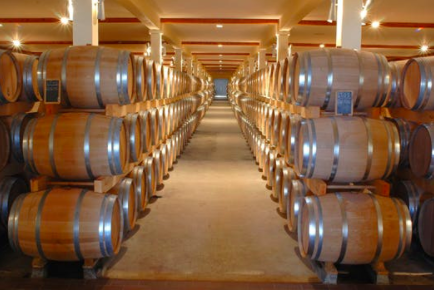 Though barrel makers source oak from all over the world-notably Russia, Hungary and Slovenia-French and American oak barrels are the two most important types and they lend some very different characteristics to wine. American oak tends to confer more obvious, sweet notes of vanilla and coconut (thanks to a higher concentration of something called lactones in the American species of wood), while tighter-grained French oak contributes more restrained savory-spicy notes. The differences between American and French oak actually start with the forests themselves. In America, the forests that supply barrel wood are privately owned; the French oak forests are mostly managed by the French government. Few producers know the names of the very best American sources, while the five key sources of French oak-Allier, Tronçais, Nevers, Vosges and Limousin-are known to winemakers and oenophiles as their names often appear on the ends of barrels. Each of the French forests produces a particular type of oak, sourced by tonneliers or brokers who specialize in a particular type of barrel. A barrel is called new if it hasn't previously been used to hold or age wine, but the wood used to make a barrel ages for two, three or even four years-the longer the aging the mellower the wood-before becoming a barrel. "Toasting" describes the process of flavoring a barrel and also reducing the astringency of the oak by placing the newly-made barrel directly over a flame. Winemakers can order barrels toasted to their specifications-light to medium, medium-plus or heavy toast; the process stops short of outright charring-directly from the barrel producer or their barrel salesman. A good barrel salesman can help interpret a winemaker's vision of a wine. One of the best in the business for decades, Mel Knox is the San Francisco-based sales consultant to two of the top tonnelleries, François Frères in Burgundy and Taransaud in Cognac. Over the years, Mr. Knox has acquired new clients after tasting wines that he felt needed his help and paying the winemakers discreet calls. Mr. Knox has probably sold more barrels to top winemakers in California than anyone else in the business-including stars like Steve Kistler and David Ramey. Mr. Ramey, a Sonoma-based winemaker, probably knows as much about barrels as Mr. Knox. He's backed away from using large quantities of new oak, most notably in his Chardonnays. His single-vineyard Chardonnays were once aged for 65-70% of the time in new oak barrels and the rest of the time in previously used barrels. "Now it's more like 20% new oak," said Mr. Ramey. This has meant a big savings on new barrels. "My wife, who writes all the checks, is ecstatic," he added. Yet for him the choice was a stylistic rather than an economic one, noted Mr. Ramey. He simply preferred the way his Chardonnays tasted with a more limited impression of oak. By contrast, he has not backed away from new oak with his Cabernet and Merlot-based Napa reds. "Those wines can absorb it without being overwhelmed," said Mr. Ramey. Of course, he added, that kind of oak has to be applied to denser, more concentrated fruit-"hillside not valley floor," in Mr. Ramey's terms-which has bigger tannins and is substantive enough to stand up to and thrive in new oak. A winemaker has to have the vision and integrity to assess his wine accurately. And of course the wine has to be worth the investment of many new $1,000 barrels each year. This last fact is especially important since the worth of a new barrel drops precipitously after it's used-much like a new car after it's driven off the dealer's lot. A used French or American oak barrel is worth about $20 according to Ron Celaya, the sales manager at Demptos Napa Cooperage, a French outfit in Napa and France. "Most winemakers will use [new] barrels for three to five years," said Mr. Celaya. His company offers winemakers a "buy back" for the barrels and ships them to whisky producers in Scotland. Like Mr. Knox, Mr. Celaya plays an active role in helping producers select the right barrel, usually tasting a wine during various stages of its development. "It comes down to tasting a few wines to get a sense of what they want," he said. If a client is looking for a sweeter profile, for example, he might recommend American over French oak. But above all, a good barrel salesman has to be able to "deconstruct" a wine and to imagine how it will evolve over time. Fortunately oenophiles don't have to deconstruct the wines they drink to know if they're too oaky. Even in a young wine, the oak should never stand out too much. A well-made wine is always balanced, whether fermented and aged in oak or not. "Aged in 100% new French oak." This signals that the winemaker has spent some money, since new French oak barrels are costly. The wine is likely to be full-bodied, densely-fruited and, when young, tannic. "Aged in American oak." American oak imparts a sweet vanilla note drinkers love or loathe. Wines aged in this kind of wood tend to be softer. Popular Silver Oak Cabernet from California is aged in American oak as are many Riojas. American oak costs a lot less, so it often shows up in cheaper wines, too. "Aged in French and American oak barrels." Some winemakers hedge their bets financially and stylistically by using both kinds of barrel, giving the wine a more tannic structure with the French oak and sweeter aromatics with the American oak.